Absolutely stunning cones of pure white flowers. Just imagine, a delightful show of snow-white blooms all summer long, with its voluminous cones of snow-white flowers, packed so densely that they look like an ice-cream cone! 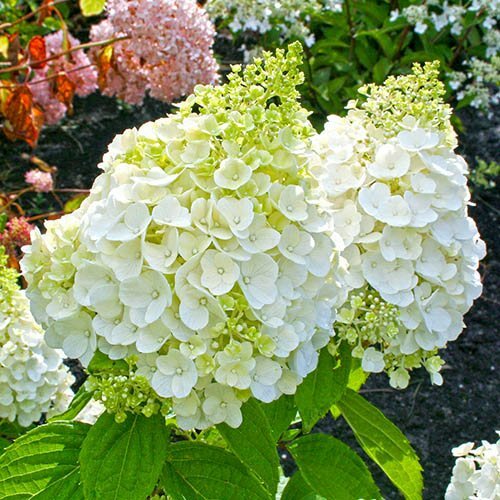 From August right through to autumn, this hydrangea is constantly in flower with blooms produced in abundance, giving an amazing show in your garden or even in pot on your deck, patio or balcony. Equally happy in the garden or your favourite container, 'Mont Blanc' brings much needed colour to your border, plus the dried flowerheads make great indoor decoration. Really easy to grow, and a great plant for beginners and more experienced gardeners alike, Mont Blanc produces its flowers on strong stems making great cut flowers! Supplied as an established plant in a 3L pot, ready to plant out. Hydrangea 'Magical Mont Blanc' will give a delightful show all summer long, with its voluminous cones of snow-white flowers, packed so densely that they look like an ice-cream cone! A member of the paniculata family of hydrangeas, their blooms are produced in abundance to give an amazing show in your garden or even in pot on your balcony - so everyone can have a go at growing this beautiful shrub - no excuses! From August right through to autumn, this hydrangea is constantly in flower, bringing much needed colour to your border, plus the dried flowerheads make great indoor decoration or can be left on the plants to give structure through the winter. Really easy to grow, and a great plant for beginners and more experienced gardeners alike, Mont Blanc produces its flowers on strong stems which means that the branches won’t bend under the weight and they make great cut flowers too. Reaching an ultimate height of around 1m high x 1.2m wide, your plant is sent as an established specimen in a 3L pot ready for immediate planting. These hydrangeas are not as fussy about soil pH as some of their mophead cousins, but do appreciate a fertile, moist position in a place where they are shaded from the sun for part of the day. Although fully hardy, 'Mont Blanc' doesn't like cold winds, and frost may damage young growth in spring, so plant them somewhere sheltered. Mulching with organic material in spring will help keep the surrounding soil moist and your plant happy in summer. Easily kept compact by pruning, this will also help produce larger, if fewer, flowers. Pruning is easy: simply cut back last year's side shoots to within 5cm (2in) of the older wood in early spring.